Process Automation	No ratings yet. Process Automation is a fully integrated solution that uses goIDit and the docMgt Work Trigger engine to add full automation to any multi-step process where assets move from step to step. goIDit is a technology that utilizes wireless sensors to track the movement of physical assets. These sensors can be attached to an asset so its location is always tracked and reported via the cloud. When the asset arrives at specific location, goIDit notifies docMgt. docMgt handles all the timers, notifies users and logs the activity for reporting. 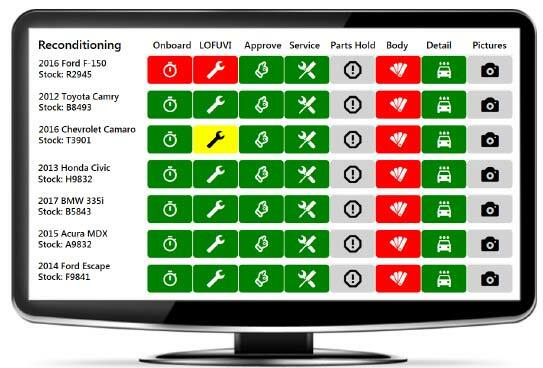 This combination of physical and workflow tracking is a powerful tool that can help improve any asset-based process. The goIDit sensors acts as a “baton” for an effortless hand off from one step to another. The users responsible for managing each step are notified when an asset moves to their step. These notifications can be via a text or email message. Timers are configured for each step to monitor its progress. If there is a delay in the process notifications are sent out so management and staff are aware of the delay. To provide better visibility, all of the activity related to the process are clearly displayed on the goIDit dashboard. With better data and more visibility into the process, issues are identified and resolved sooner to make the process more efficient. One area where goIDit sensors have made a big impact is in automotive industry. Dealers run all used vehicles through a reconditioning process before sending them to be sales lot. This is referred to as the “recon” process. goIDit can help mange the flow of vehicles through the recon process to keep it streamlined. 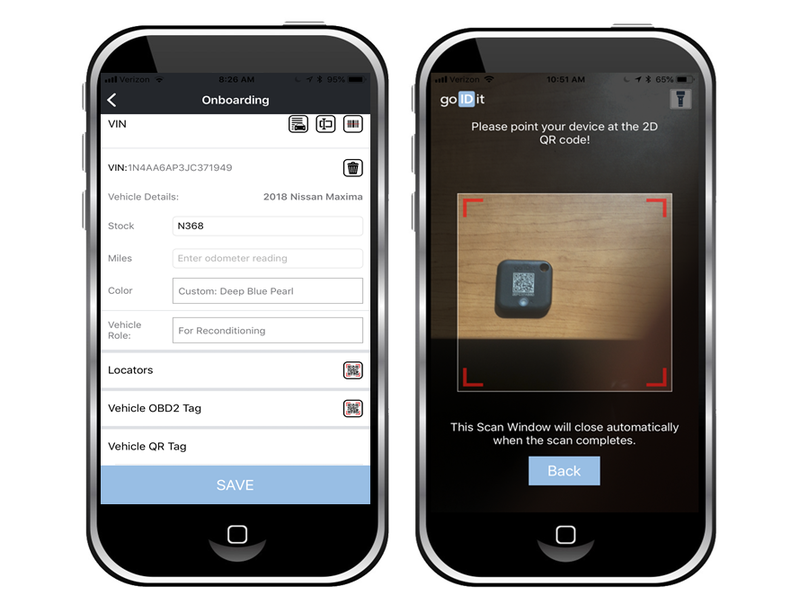 The sensors are easily on-boarded into the recon process by selecting a vehicle and reading the QR Code on the back of the sensor. The sensor can be re-used later for another vehicle by going through this same on-boarding process. Once on-boarded, the vehicle locations are tracked via their keys. By simply moving a vehicle’s key to a defined area, that vehicle is assigned to that step which can be seen on the Dashboard. Fir instance, when the keys are placed on a hook the location is sensed and the vehicle’s status is updated. The dashboard color scheme is designed to quickly show which assets are on schedule and which are running behind. Therefore, a simple glance will tell if management if there are problems. 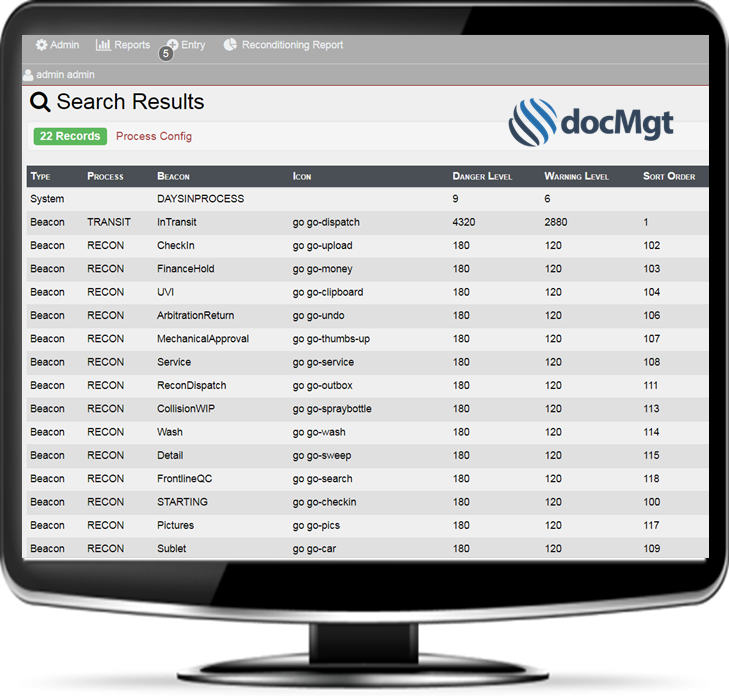 The docMgt Work Trigger system provides the back end data for the goIDit dashboard. All the logging of the times in and out of a step and the duration of time spent are all computed and handled within docMgt. All the emails and text messages are managed through the Work Trigger system. As are the follow up reminders for assets that have been at a step too long. Within docMgt each step in the process is defined by the visual icon the represents it, the time at a step that triggers a status change, and notifications associated with status changes.